Cathedral City was named after a canyon that reminded an explorer of a European cathedral. 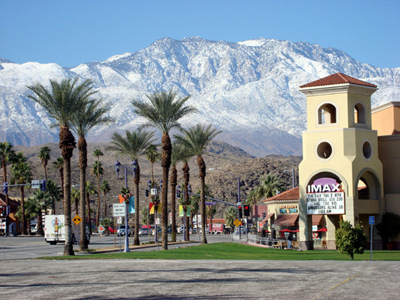 Cathedral City’s assortment of independent shops and restaurants draws people like a magnet to its excellent location between Palm Springs and Rancho Mirage. Other attractions include the IMAX Theatre, Mary Pickford Theatre, and Big League Dreams Sports Park — where the playing fields resemble scaled-down famous ballparks such as Boston’s Fenway Park, New York’s Yankee Stadium, and Chicago’s Wrigley Field. Boomer’s recreation complex, featuring miniature golf, go-karts, bumper boats, a rock wall, and a game room, brings out the kid in everyone. Cool folks love Desert Ice Castle, a full service skating facility. Or you can play in the Fountain of Life in the city’s Town Square or mountain bike along the Santa Rosa Mountains to the south of the city.